So my plan for St. Patrick’s Day was to make Shepherd’s Pie and post about it. Unfortunately, I had such a splitting headache when I got home from work that I couldn’t concentrate. I’d bought ingredients very specific to this recipe from the February 2009 Martha Stewart Living, but at the time I couldn’t remember where the recipe came from for anything. I tore through every cookbook, magazine (I thought), and website I use looking for this recipe. But the ones I found all called for ground lamb or different cuts of lamb. 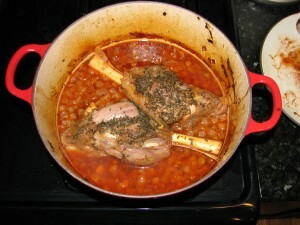 And since I’ve never cooked a lamb shank before in my life, I had no idea how to adapt what I had for those recipes. I took a nap to let the headache subside, and of course when I woke up I remembered exactly where the recipe was. But by then it was far too late to start cooking this 3+ hour version. So I made it last night instead. And shiver me leprechauns (? ), it was awesome. 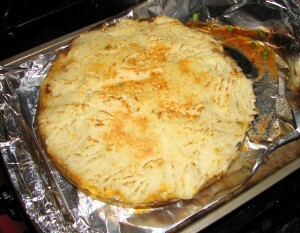 Adam said he rarely ate Shepherd’s Pie back home. I didn’t know this until we sat down to eat; I thought it was something he ate all the time. He said it’s never usually fancy like the one I made. But he took a bite and got that look in his eye and declared it amazing. And it was. 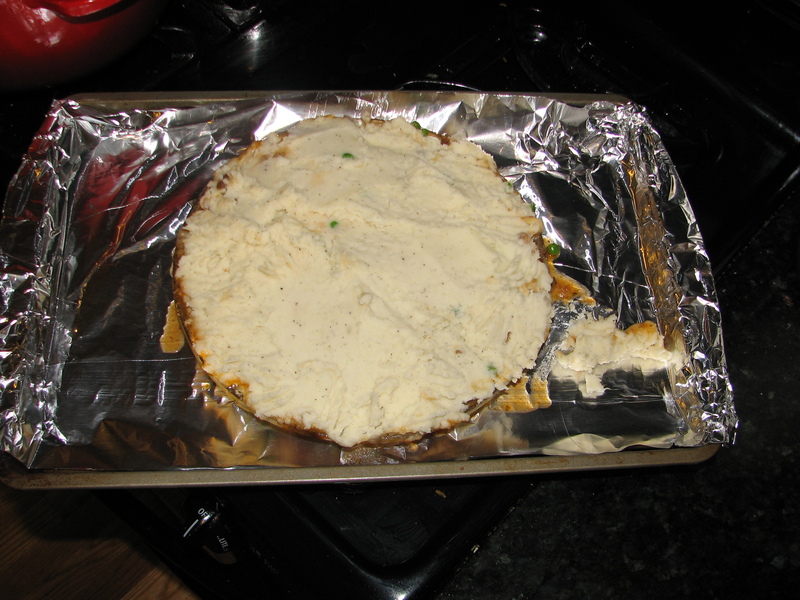 He made his magic mashed potatoes, so we didn’t follow that part of the recipe. And it holds together amazingly well and is just fantastic with the braised lamb shanks in it. I had leftovers for lunch today, and I’m already excited about having more leftovers for lunch tomorrow. 1 medium celery root, peeled, cut into 1/2-inch pieces (about 2 cups) Note: I couldn’t find this after going to 2 stores, so I used celery. Not the right thing, but it’s what I had. 1. Preheat oven to 300 degrees. 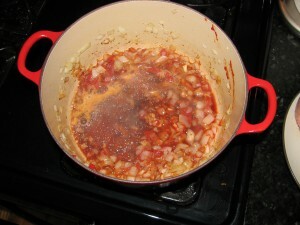 Heat oil in a large Dutch oven over medium-high heat. 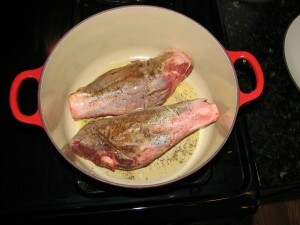 Season lamb generously with salt and pepper. Working in batches, cook until golden brown, 4 to 5 minutes per side. Transfer to a plate. Reduce heat to medium. Add onion and garlic to pot, and cook until softened, about 4 minutes. Stir in tomato paste and cook for 2 minutes. Stir in wine, bring to a boil, and cook for 1 minute. 4. Using a slotted spoon, transfer lamb to a dish, reserving sauce. 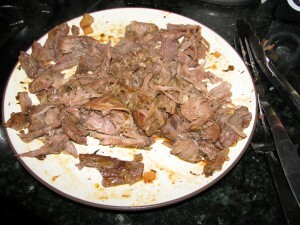 Remove meat from bones, shredding it into bite-size pieces. Skim fat from sauce. Discard bay leaf and thyme. 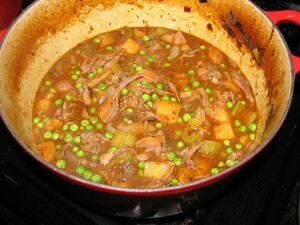 Return meat to sauce in pot, and add peas. Season with salt and pepper. 5. Preheat broiler. Spoon lamb into a 6-cup baking dish adding just enough sauce to moisten; reserve remaining sauce. Spread potatoes over lamb. 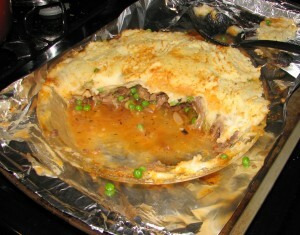 Alternatively, spoon potatoes into a pastry bag fitted with a 3/4-inch plain round tip, and pipe on top of lamb, covering surface. Broil until golden brown, about 5 minutes. Serve immediately with reserved sauce.